This comprehensive guide to the powder coating process is all the information you will need to compare, plan, purchase, install, troubleshoot, operate and improve a powder coating system. Click here to purchase your copy of the handbook. 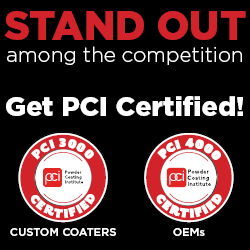 PCI Scoop is a members-only monthly e-Newsletter that keeps members abreast of industry news. Powder Coated Tough's annual Buyer's Guide issue contains the most comprehensive collection of our members' product and service offerings you can find. This guide makes it easy for our readers to find exactly what they need when it comes to powder coating. Our annual Buyer’s Guide is one of the best tools we offer to promote the use of powder coating and our member organizations. Enjoy!